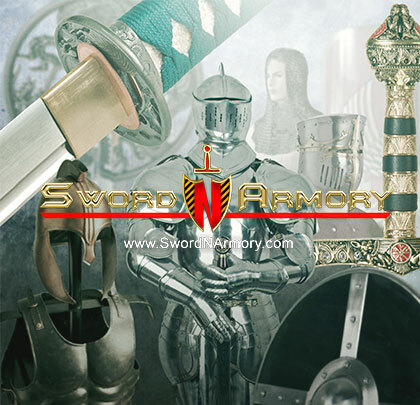 Guard: The guard of the sword is intricately built in a swept hilt design with a triple bar loop guard and square fore-guard. The quillons are a straight crossbar design with the knuckle bow attached just below it. The knuckle bow is attached with two additional guards and ends with a ball tip. Handle: The handle is black rubber, for excellent comfort and grip, with a stainless steel pommel. This is the Renaissance Rapier Saber Frog Sword Holder, which is made of genuine leather. This item has the right-handed and the left-handed design that can fit in for anyone. The frog can carry Rapiers, Side Swords, Sabers, and Medieval Swords. This item can be adjusted with leather thongs and allows the sword to hang at an angle. -Perfect for Collectors and Enthusiasts.